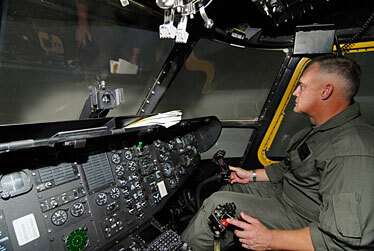 Lt. Col. Randel Parker "flies" a CH53-D Sea Stallion helicopter during a training session in an aircraft simulator at Marine Corps Base Hawaii at Kaneohe. The Navy will get a new $3.7 million helicopter flight training facility at Kaneohe Bay this summer that will include one of the military's latest cockpit simulators. The project is being constructed for Patrol and Reconnaissance Wing 2 Helicopter Antisubmarine Squadron Light 37, which flies H-60B Seahawk helicopters. Lt. Cmdr. Alan Aber, the squadron's maintenance officer, said the 50 helicopter pilots and 30 air crew members now have to spend a week in San Diego each quarter since there is no simulator the Seahawk helicopter on the island. He said the trainer, which will be operational next year, will provide "a very realistic training environment in which air crews will be able to train for almost all facets of flight experience. It allows pilots and air crew to go over everything from basic flight maneuvers and emergency procedures to advanced radio communications and mission scenarios." The simulator also will provide significant cost savings. Aber added, by allowing pilots and crews to fly missions in the trainer rather than in an actual craft. He estimated that it costs the Navy $2,500 to $3,000 an hour to fly a helicopter. It will be one of three aircraft simulators at Kaneohe Bay used by Navy and Marine pilots to maintain their proficiency. Jimmy Massey, site manager for Cubic Worldwide Technical Services, said the simulator was given a $6.5 million upgrade two years ago. It cost about $14.5 million when it was installed in 1998. The upgrade included the installation of a Mylar screen that gives Marine pilots a 220-degree view out of the cockpit. Ed Green, who manages the simulators and trainers at Kaneohe, said the five projectors mounted on top of the clam-shaped simulator and two from beneath the trainer give the Marine pilot and co-pilot using the trainer the visual sensation of flight. The trainer is mounted on six hydraulic legs, Green added, that can be tilted 60 degrees in any direction. "It's enough to make some people airsick," he added. Of the 106 flight operations that are performed by the Sea Stallion, Green said that 16 can be replicated in the simulator. Simulators also save the Marine Corps lives. Hank Tripp, CH53-D simulator instructor and evaluator, said the training can be extensive. "It would be too dangerous to attempt emergency procedures like a tail rotor failure during an actual flight." Tripp, a retired major who spent 21 years in the Marine Corps flying helicopters, said there have been fewer crashes by pilots who have trained in the simulators. During the eight years he has trained pilots in the simulator, Tripp, a 1965 Kamehameha Schools graduate, said, "None of them have crashed and those include Israeli pilots who used to come here to train." Lt. Col. Randel Parker, operations officer with Marine Aircraft Group 24, said the simulator is used by the 75 pilots in his unit. All 35 Sea Stallions belonging to the three squadrons in the air group have deployed to Iraq at least once. The simulator has helped the squadrons by having a landing strip in Iraq programmed into its database as one of its training locations. Other locations include the flight line at Marine Corps Base Hawaii at Kaneohe, Honolulu Airport, Okinawa and even the base at Yuma, Ariz. The pilots also can practice shipboard landings and takeoffs. Any weather conditions Marine pilots could face are included in the training facility's database.